Fascinating Monterey cypress trees give way to a gentle white sand slope leading into the turquoise Carmel Bay. At one end lies the Lodge at Pebble beach and Stillwater Cove, and around the opposing Carmel Point is a Frank Lloyd Wright home perched over a rocky shore. This picturesque beach is loved by locals, visitors and surfers alike. This is a favorite beach for dog walking and is the place to be at sunset. Here the tranquil Carmel River meets the ocean at a steep beach. 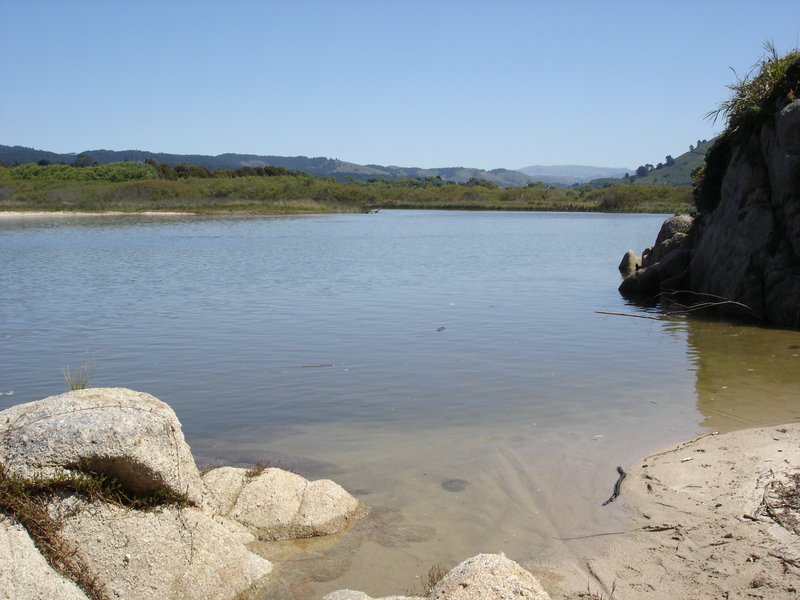 The lagoon formed behind this river mouth is both abird sanctuary and an importanthabitat for young steelhead trout. This beach is scenic and generally un-crowded. Wading in the ocean here is exceptionally dangerous. Restrooms are located adjacent to the small parking lot. Dogs welcome. Slightly South of Carmel is a subdivision called Carmel Meadows. From the rear of this small neighborhood is stair/ trail access to bluff and beach trails complete with wildflowers, wildlife and rock formations. This secluded beach extends little more than a mile south from the lagoon at Carmel River state beach until it reaches Monastery beach. An incredibly scenic mild 1.5 mile hike would take you from the Meadows neighborhood trailhead, along the bluff trail until it descends to the beach near Monastery Beach, then the other direction along the water’s edge toward the lagoon at Carmel River State Beach, and then back along the trail just above the beach until a stairway leads back up to the Meadows neighborhood trailhead. Dogs welcome. 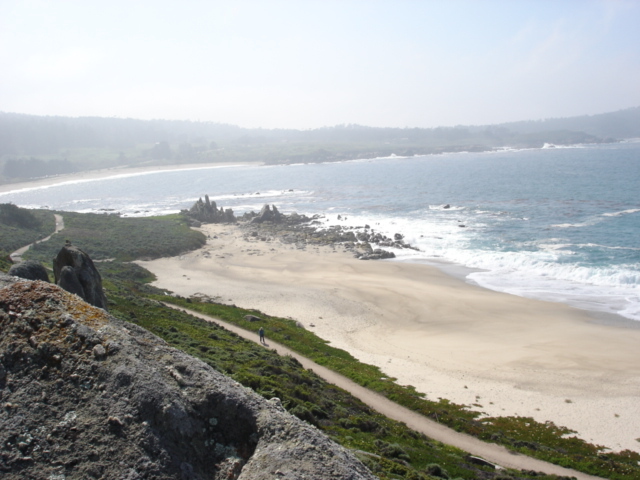 Monastery Beach is a pebbly beach with views of Carmel and Point Lobos. The water here is popular with expert scuba divers but is exceptionally hazardous. The steep drop-off makes wading dangerous even when the water appears calm at the surface. It is named for the Monastery of Carmelite nuns on the opposite side of the road which itself is worth a visit. The beach has bathrooms and water fountains. Dogs welcome. Point Lobos offers top notch beauty in a readily accessible package. Picturesque coves, stunning landscapes, fascinating geologic formations, forest and native flowers ensure there’s something for everyone just minutes south of downtown Carmel. Trails lead to stunning vistas just off a small paved road that leads through the preserve and along its perimeter. Dogs are not permitted.